Wash your face with oil? The thought sounds terrifying, I know. Especially when you’ve been dealing with cystic acne for years, as I have. Yet I’m hear to tell you that it works – at least for me! It’s all thanks to the new 100% certified organic Badger Face Care Line that launched four months ago. Badger contacted me about trying out their new oil-based face cleanser line, and I was skeptical, for sure. I am SO thankful that I took that leap of faith, though 🙂 There are four different product lines depending on your skin type. All are certified organic and natural, from a family-owned company that makes everything in the USA and Canada. I’ve had cystic acne for over a decade. I’ve tried countless natural products, and none of them have worked really well. I finally resorted to getting facials done at an eco-friendly spa in Orlando, Florida. This really seemed to work well for me, and Lisa said that I had some pretty deep infections in my pores that needed to clear up. After eight months, I was still having issues and my face was starting to become a little dry. Lisa and I were trying to find a suitable cleanser for me without any ingredients that I was allergic to. So, here I was, with flaming acne (from a reaction to a new cleanser that I had tried) that just WOULDN’T GO AWAY, and I was getting ready to head to Europe. It just so happened that I had a box of Badger Face Care waiting for me, tempting me to cleanse my skin with something that I didn’t feel entirely comfortable doing. I’ll never forget that first time of washing my skin with Badger Face Cleansing Oil. I was in a hotel room in Frankfurt, Germany – jet lagged and exhausted. I wasn’t looking too hot, if you know what I mean. Then I washed my face and my skin instantly started to glow. Within minutes, I noticed my skin felt fuller, firmer and more radiant. I’m not kidding. I thought it was just a short-term reaction, and that my face would go back to normal in a few days, but no. As I traveled through Germany, switching hotels every night, spending most of the days outdoors in the bitter weather and catching a cold, my skin continued to radiate health. Surely this was a freak occurrence, I thought. I was determined to give it one month, to go through a hormonal acne cycle. And I did. And my skin still continued to look better with fewer breakouts. In 5 weeks, my skin had about 80-90% fewer breakouts than normal, I’d guess. 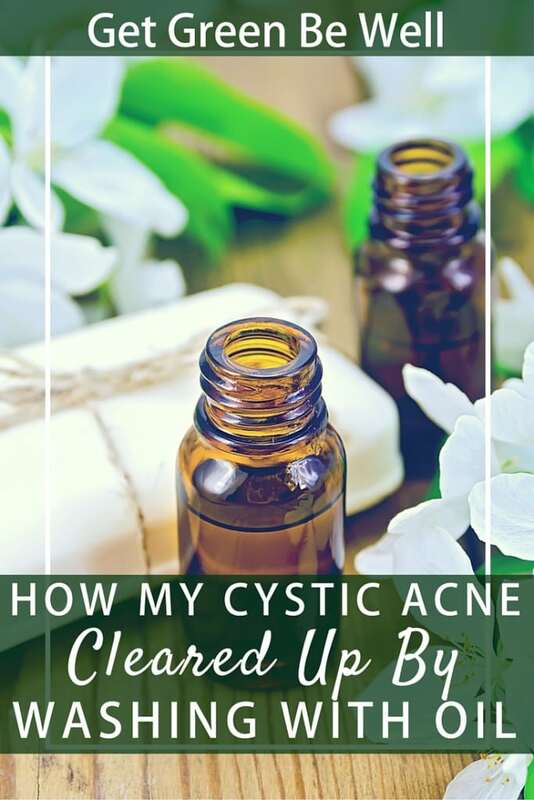 I did have small whiteheads and blackheads that rose to the surface on their own, but I read that this is actually normal as your pores get really cleaned out for the oil. They were tiny and easily manageable. I developed one cystic acne bump. Jaime McGuigan, a Holistic Chemist for the W.S. Badger Company, said that my response was typical. “Any time you make a major change in your skin-care routine you can expect to see some break-outs, a period of time referred to as an “initial breakout period” or a “purging stage.” The concept behind the Oil Cleansing Method (OCM) is that like dissolves like which means that the new oil will dissolve and replace the old oil that is deep inside your pores. As this old oil loosens, particularly in heavily congested areas of your skin, you will often see break-outs as a response. It can take up to a month for your skin to adjust to your new skin care routine but once the old oil has been thoroughly cleaned from your pores this response should subside,” McGuigan said. The final test was to go back to get a facial. Lisa knows my skin from a professional perspective, so if she noticed a difference, then that would settle it. She said my skin looked really good and that even the scars were fading. 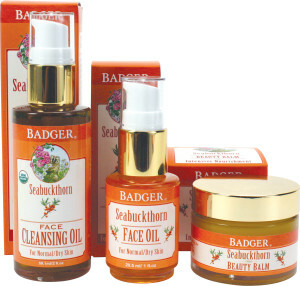 I said that I was using Seabuckthorn Badger Face Cleansing Oil. She agreed that people don’t want to hear it, but acne does love oil, meaning that it will clear up because oil attracts oil and will lift it out. She agreed that the high Vitamin C of the Seabuckthorn was helping to reduce the scarring. When it came time for extractions, there weren’t very many to do. Again, she remarked on how much my skin had improved. And that’s my story. I used the Seabuckthorn line of Badger Face Care Products and I’m happy that I did. For me, it has made a huge difference, and actually brought back some joy. It was horrible seeing those acne bumps on my skin for years and not knowing how to get rid of them. I forgot that skin could actually be this smooth. My acne scars are fading, and will hopefully continue to do so. I’m using the Seabuckthorn Face Oil on my neck, too. It’s a wonderfully scented, rich product that really is keeping my skin supple and moisturized. Disclosure: Badger sent me products to review. I was not compensated in any other way to write this blog post and all reviews are (thankfully!) my own. Interested in trying out Badger products? Get them for less at Vitacost. Login in through Ebates first and you’ll save even more! Please be aware these are affiliate links. Get Green: The ingredients used in Badger products are all natural and organic. That means that less pesticides and nasty stuff had to be used in the environment to grow their ingredients. They’re also a family owned company sourcing nearly everything in New Hampshire, with a few products made in Iowa and Canada. Nothing overseas, no excessive shipping and freight transportation fuel use to get it here. The Badger facility would qualify for LEED Silver status and offers a host of eco-friendly features that are more sustainable to the environment. Be Well: The ingredients used are safe enough to eat, because they’re food grade. What you rub onto your skin, will absorb into your body and blood system. Isn’t it nice to know that these are ingredients you wouldn’t mind consuming, too? In fact, the Badger team uses the same olive oil found in their skin care as part of their organic lunches on site! Hi! Thanks for writing this great article. I just have a question: so do you use the Face Oil after cleaning your face with the Cleansing Oil? Could you clarify the steps you take in your face cleansing regime? Thank you so much! Hi! Yes, you clean your face first with the Cleansing Oil. Then, for moisturizing, you would apply Face Oil afterwards. You might just want to try one at a time though to see how you respond to either one.